South Korea will neither develop nor possess nuclear weapons, President Moon Jae-in said Wednesday, effectively shooting down calls from conservative quarters to bring back US tactical nuclear weapons. Addressing the National Assembly on Wednesday, Moon said his administration has clear principles in issues regarding security on the Korean Peninsula, the priorities of which are peace and complete denuclearization. “Under the denuclearization declaration, jointly made by the South and the North, giving North Korea the status of a nuclear state cannot be countenanced nor accepted. Neither will we (South Korea) develop nor possess nuclear weapons,” Moon said. With North Korea defying international warnings and sanctions in its nuclear ambitions, some in the conservative bloc have called for redeployment of US tactical nuclear weapons in the South. Moon went on to reiterate his position that Seoul must play the leading role in resolving security issues surrounding the peninsula, and that the North Korean nuclear issue must be resolved peacefully. “Sanctions and pressure are the means to lead North Korea to the right choice, and to dialogue,” Moon said. Moon went on to say that his administration is working through all possible channels to bring out denuclearization of North Korea, and urged the political parties to set aside their differences on security issues. For much of his parliamentary address, his second since taking office on May 10, Moon focused on the 429 trillion won ($384.5 billion) budget bill and his vision of establishing a new economic paradigm. “The structure in which household income drops and economic inequality grows despite (the national) economy growing must be changed,” Moon said. Since taking office, Moon has called for an income-led growth model for South Korea. As part of the plans to achieve the goal, the Moon administration will create 810,000 public sector jobs. Moon said that the administration cut expenditure by 11.5 trillion won in drawing up the budget, and submitted tax reform measures that would add 5.5 trillion won to the government’s tax revenues. “The budget and tax revision bills focus on employment, increasing household income, innovative growth and public safety and national security,” Moon said. According to Moon, the employment-related budget has been set at 19.2 trillion won, up 2.1 trillion won from this year. Much of the employment budget will go towards increasing public sector jobs and employment subsidies for small and medium businesses. Related measures also include more welfare, which according to the plans would lead to increasing expendable income. New, and improved welfare measures include 100,000 won monthly child care subsidy that will be introduced next year, and a higher basic pension for senior citizens. Regarding taxes, Moon said that higher income and corporate tax rates for the highest earning individuals and companies would go towards shoring up support for SMEs and small merchants. Moon also touched on his administration’s reform efforts, saying that government organs must be reformed, and that corruption and irregularities in the public sector will be rooted out. 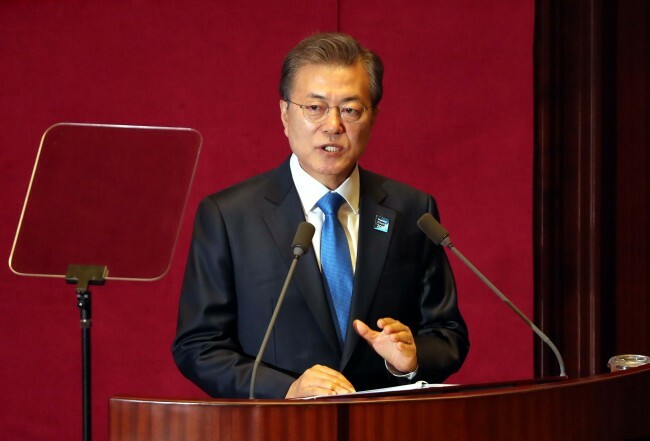 Moon’s speech drew mixed reactions from the political arena, with the ruling Democratic Party of Korea praising the speech, and opposition parties offering criticisms of varying intensity. The conservative party argued that Moon’s “people-centric economy” appears to be based on the demands of hard-line labor unions, and will ruin the country’s finances.